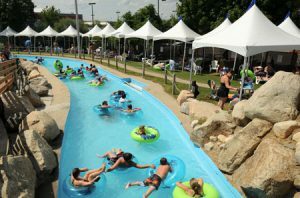 Located in East Wareham, Massachusetts, this water park is filled with rides, cabanas and more! Start be renting your own cabana for the whole day, creating an awesome spot for relaxing or a central meeting point for your group! Tubes too can be rented for the day which makes it easy to navigate around the rides and attraction at this amazing park! Start your day at Squid Row, a daring tube ride for two friends looking to compete! One tube is open, the other is closed! Pirate's Plunge body slide will plummet you through darkness as you drop down crazy feet to the end where you are dropped in to the cooling waters below. Grab that inner tube and head to The Canal where your tube will take you through the curves and bends of a fun ride! Definitely don't leave before heading to Hurricane Hill complete with 5 varying slides that you can try out. Each has its own dips and bends designed for the avid thrill seeker! For a more relaxing afternoon, check out Mussel Beach a large wave pool for everybody in your group. Those who wish to can even relax beach side while they watch others have fun with the waves! The little ones in your group will definitely enjoy Little Neck Beach where they play at all of the fun play structures or Minnows and Guppies Way where kids can try out the human carwash, suspension bridge/slide, water igloor and more! Water Wizz has no Season Passes available. Check in regularly to check for updates. Admission Tickets are ONLY available at the Water Wizz Entrance Gate. Note to our visitors Water Wizz coupons and specials can change without notice. So please visit their official website to make sure of the latest pricing and coupons.